Spinning is one of the hottest studio workouts with so many different variations of classes these days. It is a great, high intensity, cardio workout with much less impact than other traditional cardio workouts. This makes it a perfect choice for those with injuries. Many spinning studios now have in house DJs and crazy lighting effects that keep all their clients motivated and engaged. What are the health & fitness benefits? 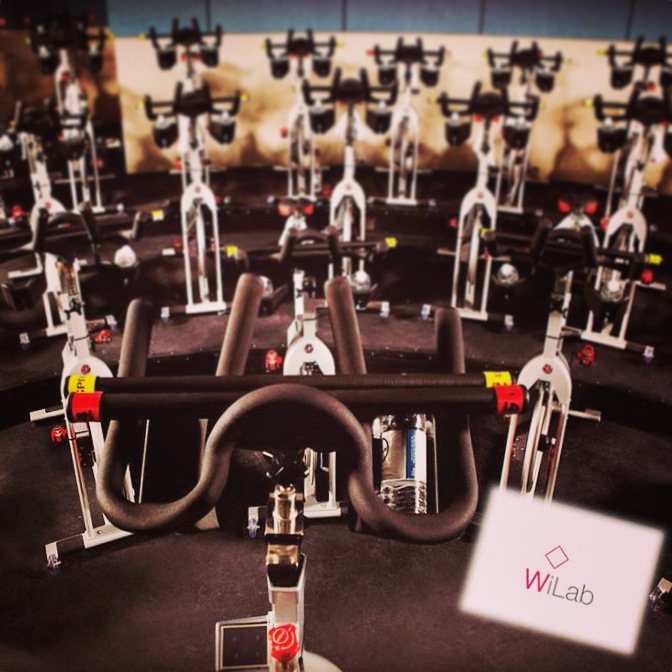 One of the most talked about spinning studios around the United States is FlyWheel. Flywheel is unique because each of its’ studios has stadium seating; you will never have to worry about struggling to see the instructor. Flywheel also incorporates weighted hand bars which make the class a full body workout! Flywheel shuts off all the lights and blasts their up tempo music, making the atmosphere very edgy and cool. What makes FlyWheel unique and keeps you coming back for more? I love going when I need a solid, sweaty, no BS workout. Their music is loud, their studio is dark and their workouts are intense (in a good way); I think what sets Flywheel apart from other studios is their instructors, amazing playlists and the fact that their classes have a competitive edge — they have a “Torq board” which tracks your overall power throughout class – you can either opt to have your numbers public, or keep them private. Either way, I like that this helps you push yourself and reach your personal wellness goals, or if you like some friendly competition you can definitely “race” against other riders! Who is your favorite FlyWheel instructor & why? My favorite instructor is Christina Lodde because she always gives me the same, intense workout every time – she’s not messing around! I also love Jessica Latshaw, who always inspires me to push myself and think outside the box in and outside the studio! Staying fit for your New Year resolution and want to win 2 FREE @flywheelsports passes? To kick off 2015, I am excited to announce a Giveaway with Women’s iLab (@womensilab) & Rachel Chemerynski (@HealthyChicks). The winner receives 2 FREE FlyWheel passes that can be used at any FlyWheel location within the United States. All you have to do is follow @womensilab @meeshmcg33 and @healthychicks on Instagram and like the Flywheel photo (see below) that will be posted on each Instagram account! One winner will be picked at random and entry concludes at midnight on Friday 1/30! Want to gain more entries to win? 1. Share the contest on Twitter by re-tweeting this post via @sunsuperfoods33, @healthychicks and/or @womensilab!